In November last year, Microsoft launched Word, Excel and PowerPoint iOS apps with the ability to create and do basic editing to documents for free. Today, the company has finally completed its “office everywhere” dream with the release of the official Outlook app for iPhone and iPad, which is now available as a free download in the App Store. Also available for Android in Google Play, the newly released Outlook apps are based on Acompli, an app from a startup that Microsoft acquired last year (via FastCompany). Acompli’s cofounder and CEO Javier Soltero, who is now the general manager of Outlook, said in an interview that email is an “extraordinarily critical business tool”, adding that the goal with these new editions of Outlook was to please a wide range of email users. He also highlighted that instead of trying too hard to mimic Outlook in its desktop form, the company has focused on features tailored to mobile devices, including seamless searching of messages stored on the server and the ability to pull in information from other Office apps. Outlook automatically triages your inbox for you, surfacing your most important email. Less relevant email is placed in your “Other” inbox. Swipe to quickly delete, archive, or schedule messages. Schedule emails and they will return to your inbox at a later time. Switching between your email and calendar apps is a thing of the past. 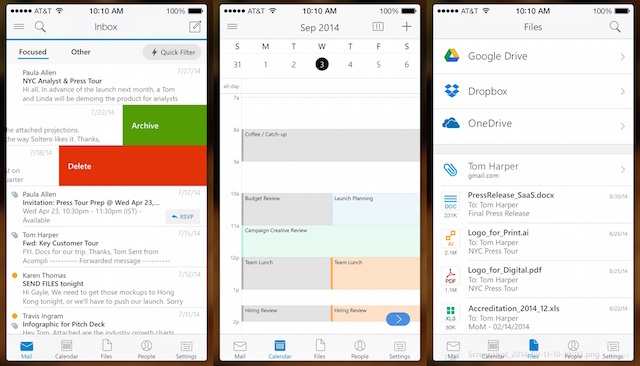 Outlook includes your calendar and notifies you with appointment reminders. Find available meeting times and share them in email or schedule a meeting. View and attach any file from your email, OneDrive, Dropbox, and other accounts with just a few taps. Send large files even if you haven’t downloaded them to your phone. Filter your inbox to only show messages that are unread, flagged, or have attachments, with a single tap. Quickly find the right messages, people and files by typing just a few letters. Outlook shows people you communicate with most often, and lets you conveniently drill down to see all related emails, meetings and files.